How does a CTA help to convert visitors into leads? 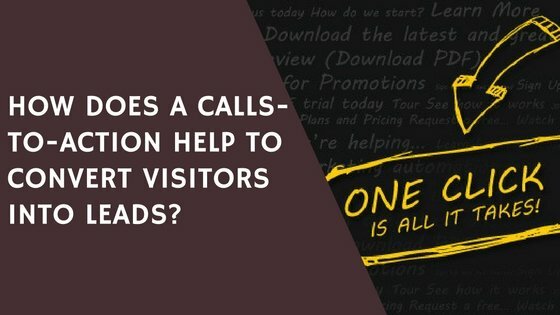 How Does a Calls-To-Action Help to Convert Visitors Into Leads? Home >> Business >> How Does a Calls-To-Action Help to Convert Visitors Into Leads? In the first place you create your attractive website, fill with captivating contents and most importantly optimize your website to rank higher in search engines to drive high traffic. As your plan, they find your website, scrutinize your articles and leave at last. You would want to build a long-lasting link with your visitors and make them stay there. Calls To Action (CTA) is the strategy that will help you with making the visitors as your potential and paying customers. So you might ponder that how does a CTA help to convert visitors into leads? Call to Action is a strategic instruction designed and encouraged to get an action by a visitor of a website. This is the perfect way to convert website visitors into leads. While taking an action, a visitor shares his/her email address with you and permission to communicate with them. Call to action helps to develop the connection with the visitors so that they will visit your website in future too. So how do you exactly you can convert visitors into leads using CTAs? Get a better understanding of your sales channel and recognize where the visitor is most likely to be in the sales cycle when they visit your website. There now you can identify the action you want from your visitor to take. Knowing clearly about your target audience helps you answer their worries. You can identify the buyers of yours by making their buyer personas. This will help you throughout the interactive session with your customer because you will have a complete understanding of the words and languages searched and spoken by your target audiences. Make your call to action theme such simple that the visitors take no time to click and view your offers. If it’s confusing, they will not take any actions. Create straightforward steps from CTA, landing pages and thank you pages. Place your CTA section to a place where it is viewable to a visitor and feel easier to find. For best results, place the CTA at the top and upfront position. Coordinate with the words used in CTA’s to find out if it is best working for your targeted audiences. Do some extra efforts by replacing and revising the words and offers to see if it makes any differences in result. These tips will guide you about customers visiting your site and convert visitors into leads.